Do not run out of fuel! What’s more in Earn to Die 2 MOD? Sometimes in life, there are things you can’t accomplish with just once. We have to try many ways, go through many failures and get close to success. 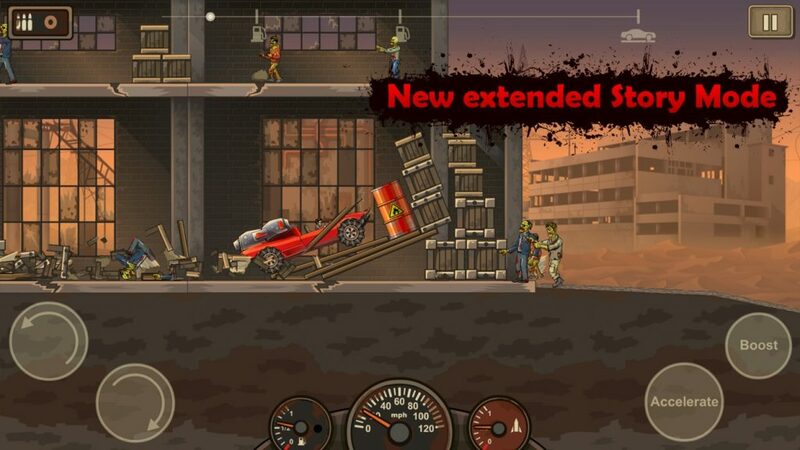 That’s also the way to win Earn to Die 2 – the zombie racing game of Not Doppler. With the familiar context of the world being devastated by zombie epidemics, all big cities are destroyed. 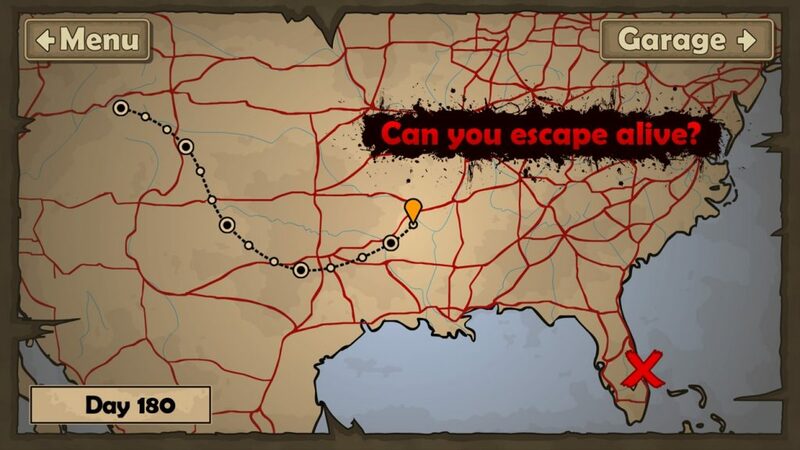 In the game, you will join with Quentin to find a way to go to Florida, where the evacuation ship awaits survivors. The problem here is that Quentin is in the west, and the path to it is flooded with ferocious zombies. This game has the same gameplay as the terrain racing games like Hill Climb Racing. Your only goal is to survive the journey instead of defeating your opponents to win the championship. In fact, you can’t survive in this game. If you survive, overcome all the dangers to reach the east, that means there is no goal for you anymore. In Part 2, the Story Mode has been upgraded and promised to be “five times longer than its predecessor” according to what the publisher said. The greatest joy when playing Earn to Die 2 is what happens on your journey to your destination. The game has a lot of obstacles, zombies, pitfalls, holes, … to stop you. Just one of the above factors is enough for you to die. But after playing this game for two days, I realized that the main reason you died was that the fuel ran out. Not zombies or horrible monsters, your cars are your enemies. First, you are provided with an old and cheap car. With the small amount of fuel available, you can move a segment to the right of your screen. Earn to Die 2 save your milestones and the next time you have to try to go further. 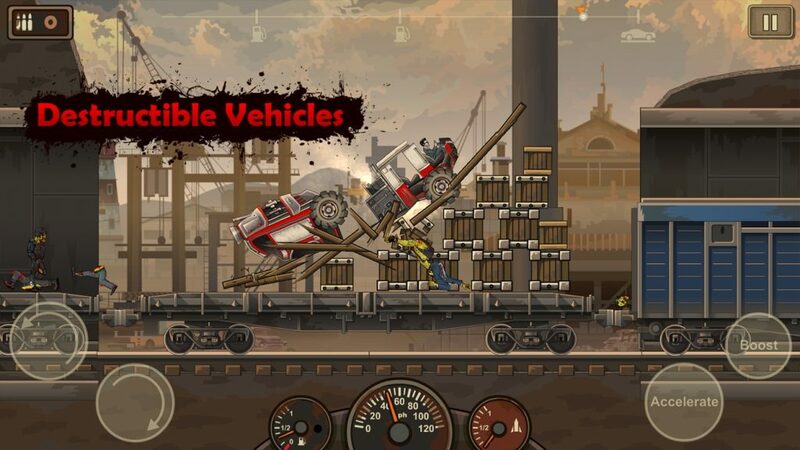 Use keys such as brakes, acceleration and arrow keys to control the center of the vehicle and keep the car balanced, avoiding obstacles and killing zombies blocking the way by crashing into them. You will receive money corresponding to the distance traveled, the number of zombies you kill and the impressive jumps. Use that money to upgrade or buy some accessories and weapons. Basically, you have to go as far as possible. So fuel and wheel upgrades are necessary for the car to go further. Remember, “running out of fuel means death”. 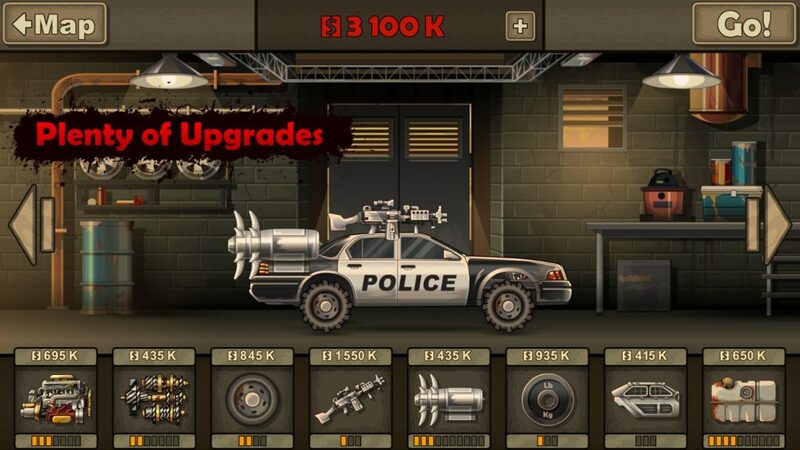 In the current version, Earn to Die 2 has 10 different vehicles for you to choose from, such as cars, trucks, fire trucks or even an ice cream truck. Unlock new cars, upgrade them, equip the most powerful weapons and participate in the extremely exciting zombie smashing journey. Of course, the goal of every player in Earn to Die 2 is to upgrade a giant car with advanced weapons and enjoy the feeling of your car crushing everything. However, to have such a car requires you to be very patient, play a thousand times to get the amount of money that the game requires. With Earn to Die 2 MOD, you don’t need to worry about that. MOD version gives you free shopping feature. Just choose what you want to upgrade and buy it, you can own all the cars and accessories you want for free. Earn to Die 2 has been significantly upgraded in graphics and image quality compared to its predecessor. Everything is more elaborate, more realistic images. The physical movement of the game is also very impressive. The way the car destroyed everything really made me feel excited. 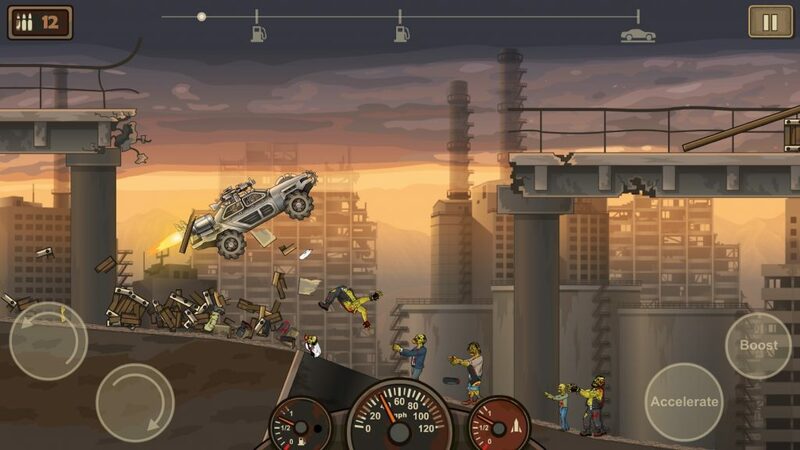 Overall, Earn to Die 2 APK is a game not for those who want to win with just one first play. The game has lots of fun and lots of interesting things to explore, such as building a destructive vehicle from the junkyard. Don’t forget the message the game wants to send to the player “To succeed, we must learn to stand up from tripping times”. 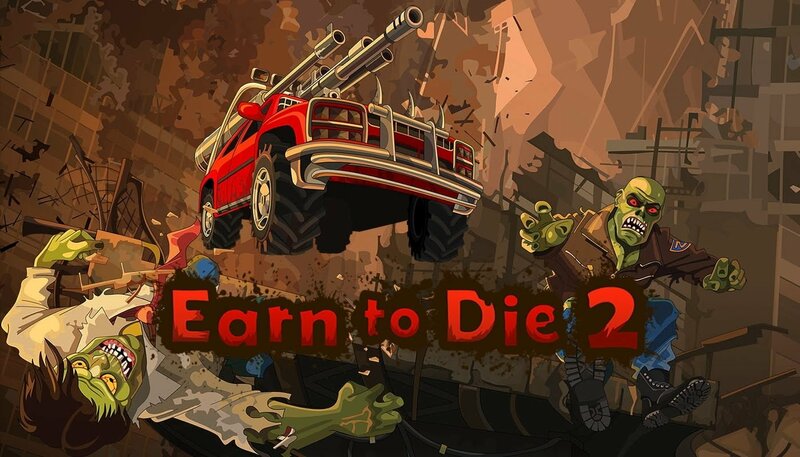 Earn to Die 2 MOD APK is ready to download! Depending on your needs, you can download Earn to Die 2 MOD APK or Earn to Die 2 Original APK. Or install from Google Play / App Store if you want.